Learning to read is one of the biggest academic focuses for all kids. Most of the educational resources and workbooks place large emphasis on alphabet, phonics, sentence structure, and vocabulary… all essential parts of reading! However, one thing we DO have to be careful about is starting active reading lessons too soon. For one, a child needs to be developmentally ready for reading. And another, the last thing you want is for your child to have academic burn out early in their educational journey. But just because you’re not sitting with your child, quizzing them with flash cards and workbooks, doesn’t mean you can’t teach them to read under the radar. Here at LGP, we are all about teaching kids in ways where they don’t know they’re learning. So here are some great little things you can do to prepare your child to read passively! This is something you can do from in utero and beyond! 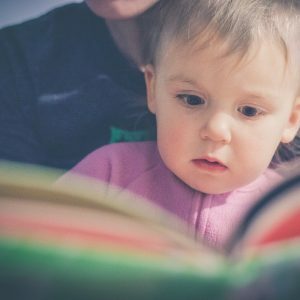 Reading with your child is by far the most effective way to teach your child to love books, to use their imagination, and to work on reading comprehension. 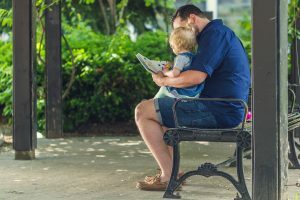 Simply asking your child what is happening in the story or asking them what they think will happen next is teaching your child to pay attention to the words and think about how the story is progressing. This is all part of reading comprehension. Passively, your child will be learning about plot, the flow of a story, common words, and vocabulary. They will learn about setting, imagination, fiction and non-fiction. They will learn about an author and illustrator. They will also learn the lessons in the books themselves. Whether you are reading a story or reading a cereal box, pointing to words while reading helps your child associate the sound of the words with the letters of the word. With that simple gesture, you will be teaching your child how a words is set up, simple decoding techniques, and auditory recognition of the word. You will also be teaching your child that words are everywhere around them and also have meanings. They will start to be curious about the words around them and want to know how to read them. Your child will also start memorizing the words without knowing it and begin to recognize spelling! All from a finger point! All it takes a second and some colorful markers to do the trick! Write a list with a combination of words and drawings to help your child understand what the list is about. It doesn’t have to be pretty or complex. The pictures don’t even have to make sense to anyone else but you and your child! 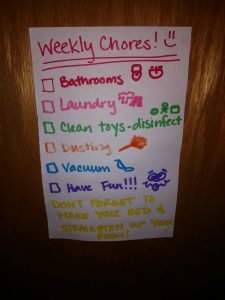 Simply having the list in a written format will help your child have a physical connection to the words and ideas it is representing. Kinda of like having a book as opposed to an oral story. Refer to the list when you are implementing it. Point to the words while reading it out loud with your child. 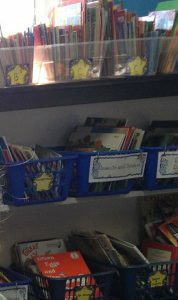 In some classrooms, especially in preschool or kindergarten rooms, some teachers will have labels all around their rooms. These labels show students where pencils, crayons, tables, chairs, and other things around the room are. It is also making students aware of the words that represents these things. So they will not only recognize what a pencil is, but also begin to recognize what the word pencil looks like. They will associate: Every time I get a pencil, I see this word “p-e-n-c-i-l”. You can do that at home too! I have taken to labeling different bins and drawers for my kiddos. While it’s helping them stay organized more independently (a blessing in itself! ), it’s also helping them read! I label different bins for my kids’ toys to go in using words and pictures. I also label their drawers in their bedrooms with clothing labels. It helps them know where to put their clothes, as well as shows them the words associated with clothing. Side note: This method can also be used if you want to learn a different language! You can label things around your house like your cabinets and desk. When you take something out or use something, you point to the word and say it out loud as you pick it up. With the digitization of so many media things now-a-days, shows and movies are right at your child’s fingertips. Use this to your advantage and turn on subtitles when you watch a show or movie. My jaw hit the floor because I was doing all the things I listed here with him, but I wasn’t actively teaching him how to read at this point. I explained the word to him and he went “okay!” and proceeded to play and finish watching the movie. 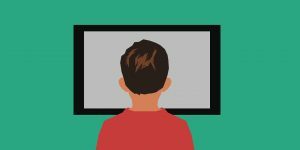 Just like when you point to each word you’re reading, having subtitles on the screen will help your child associate the sounds of the words with the look of the word. It will also get your child used to seeing words in sentences. Try these 5 super simple things with your child and see the difference you will make! As always, thank you for be a part of this amazing journey of parenthood! To learn more about the LGP Community, sign up for our free membership and gain access to our exclusive LGP Village today!